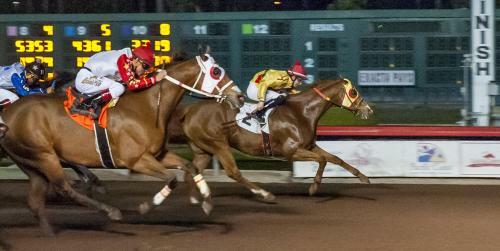 Ed Allred’s millionaire sprinter He Looks Hot, already an AQHA Supreme Race Course, added to his impressive resume by scoring his 11th career victory while holding off Katies Easy Moves to win the $35,000 Moonist Handicap on Friday at Los Alamitos. He Looks Hot earned $19,250 to take his career bankroll to $1,232,673. The 7-yuear-old gelding has won at least one stakes race in 2014, 2016, 2017, 2018 and now 2019. Four of those stakes victories have come in Grade 1 stakes events. Prior to taking the Moonist, He Looks Hot won the Grade 1 Los Alamitos Two Million Futurity in 2014, Grade 1 Vessels Maturity and Nutrena Handicap in 2016, Restricted Grade 1 Spencer Childers California Breeders Championship Handicap in 2017 ; and Grade 1 Robert Boniface Los Alamitos Invitational Championship in 2018. He’ll attempt to add another Grade 1 stakes victory in July, as he’ll now be pointed to the Vessels Maturity trials to be held on June 16. Caballo Rapido LLC & Five Livestock Company LLC’s Katies Easy Moves, third in the Grade 1 Los Alamitos Winter Championship in his last start, bumped at the break, but finished powerfully to earn $7,875 for running second. Jesus Rios Ayala piloted the Monty Arrossa-trained runner. Ron Hartley’s multiple derby winner Black Fryday and Martha Wells’ Yanque dead-heated for third place. Scoopie Jess, Da One Two Special, My Favorite Cartel, One Proud Eagle, Cm A Pollitical Star and Rite Quick completed the field.